Gachibowli in Hyderabad is a market comprising of a 15 km stretch from Nallagandla-Tellapur along the Financial District, Nanakramguda, Kokapet, Narsingi, Raidurg up to Manikonda. Recognized as one of the popular IT-ITeS and BFSI hubs of Hyderabad, Gachibowli has emerged as a sought-after destination for commercial office spaces as well as residential developments. Gachibowli falls in the western periphery of Hyderabad and was once a far-flung region with minimal development and almost negligible residential activity. However, it has witnessed a tremendous transformation in terms of commercial and residential real estate activity driven primarily by the many major IT-ITeS companies now operating there. Only 6 km from HITEC City, Gachibowli has ICICI, CMC, Franklin Templeton, UBS, Cognizant, IBM, Microsoft, Infosys and many other large firms driving multi-faceted real estate demand. As a result, it has emerged as a top employment destination in Hyderabad and attracts working professionals from various parts of India. These commercial office developments have attracted residential developers to come up with projects in the nearby micro-markets, and now the region is booming with massive real estate activity. While there is a lot of residential and commercial real estate activity, retail developments have yet to pick up in Gachibowli; the nearest mall (Inorbit) is located 6 km away. However, top-rated education institutes such as ISB, University of Hyderabad, IIIT and National Institute of Tourism and Hospitality Management are present here – a major residential draw. – Road: Gachibowli has easy access to Outer Ring Road (ORR) via Old Mumbai Highway, Pullela Gopichand Academy road as well as ISB road. The micro-market also provides smooth access to Rajiv Gandhi International Airport Shamshabad, HITEC City and Mehdipatnam. – Rail: The nearest MMTS railway station is Lingampally, located 7 km away from Gachibowli and HITEC City railway station is at a distance of 9 km. – Metro rail: Phase 2 of L&T Hyderabad metro rail (HMR) is planned to come between Raidurg – Gachibowli – Shamshabad Airport. Over the last five years, Gachibowli has added around 10,900 housing units. 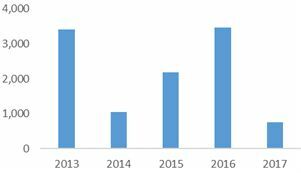 Around 32% of the current supply was added in 2016 itself, indicating the recentness of residential developments. Working professionals from nearby IT-ITeS and BFSI companies find it convenient to reside at Gachibowli. As the region primarily caters to the requirements of the junior-to-mid level employees, 66% of the supply came in the mid-range INR 40-80 lakh price bracket. The presence of a significant unsold inventory (5,500 units as of Q4-2017) led to a decline in fresh supply in 2017, and the developers active here are focusing on existing project execution. 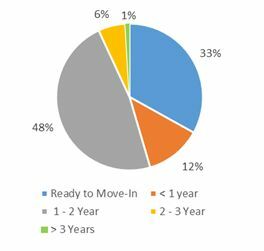 Approximately 33% units (around 3,600) of the total supply since 2013) are in ready-to-move-in stages. This indicates that the region has a good execution track record. Around 48% (5,200) of the total supply since 2013 is likely to complete in 1-2 years, and around 12% (nearly 1,400 units) is likely to complete in less than a year. Hence, nearly 6,800 units (~60%) of the total supply will be pumped into Gachibowli in less than two years. Residential property prices in Gachibowli have risen linearly during the past two years, with the average price in Q4-2017 being INR 4,600/sqft. Despite the low new launches during the last years, prices have appreciated by around 7% during the past 12 months. With rising employment opportunities in the region and improving physical infrastructure, buyers are preferring Gachibowli and surrounding micro-markets as their residential destinations. In fact, Gachibowli is one of the most favoured residential destinations in Hyderabad today. The location already has excellent connectivity through ORR, and infrastructure upgrades such as the Raidurg-Gachibowli-Shamshabad metro line will boost connectivity between the airport, Fab City, Tolichowki, Manikonda and Raidurg IT offices. Also, the State Government’s Strategic Road Development Plan (SRDP) – package IV is executing a multiple underpass projects from Biodiversity via Mindspace to Madhapur to ease traffic congestion at peak hours. The presence of several corporate offices in the vicinity and availability of residential developments at competitive rates will continue to encourage homebuyers to look at Gachibowli for their housing needs.